Smart Meters and the Federal Election – Where do candidates and parties stand? Stop Smart Meters Australia and Citizens Advocating for a Safe Environment have received the following responses from candidates and political parties regarding the forced installation of smart meters in Victoria. a) They are not properly tested. c) They give too much government control over power use. e) The current Victorian State Government before they were elected promised all Victorians that nobody would be forced to have a smart meter. This entry was posted in Smart Meter and tagged Australia, DLP, Katter's Australian Party, Mark Farrell, Smart meter, Victoria, Victorians. Bookmark the permalink. 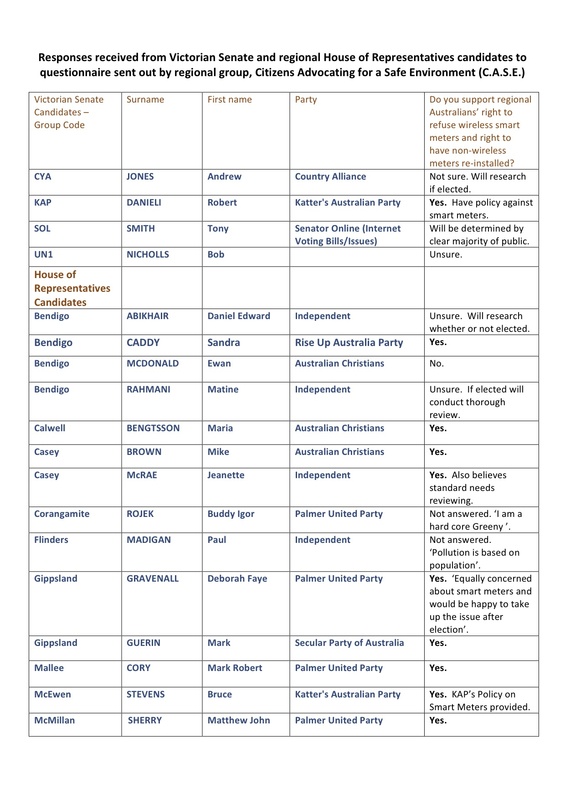 28 Responses to Smart Meters and the Federal Election – Where do candidates and parties stand? Just like the last Victorian Labor Government, this Victorian incumbent Liberal Party Government is still forcing these Poisonous Microwave so-called ‘ smart meter machines’ onto Victorian private home and small business owners whilst these customers are either out shopping or seemingly away from home for any other reason. The people actually doing a good deal of the intimidating are these so-called Smart Meter Installer Men who in the main, are not Victorian ‘A’ Grade Licensed Electricians as demanded by the Victorian Electricity Union, but men that have far less training and knowledge regarding Electricity. Others committing a good deal of intimidating of their Electricity Customers are the Customer Relations Officers at PowerCor, City Power Jemena, SP AusNet and United Energy Distribution, I know for I had been bullied by PowerCor for nearly nine (9) months before I sent my last Polite but hard hitting Registered Letter to the C.E.O of PowerCor along with the Commonwealth A.C.C.C Anti-Harassment Notice for $1.1 Million Dollars which had to be answered by PowerCor within fourteen (14) days as this Legal Commonwealth of Australia Notice Stipulated ….the following along with more too long to publish here. “ Your Company is prohibited and forbidden from communication in any manner, with the intent to solicit for the installation of a “smart meter” or meter containing wireless communication function(s) at the following (service) address: (Insert your address). Such an act is herein referred to as a PROHIBITED ACT. I have lawful and legal standing and claim of right to make such a demand. There is more to this notice than this please see this Legal Commonwealth Notice in the Attachments Area. Please also note that this Legal Commonwealth of Australia Notice from the A.C.C.C Negates any Australian States from making Undue or Harassing Demands on anybody living in any of these States in Australia, including those of the State of Victoria in respect to any goods or services, being forced on anybody, in this case that of the now proving to be very dangerous to Human and Animal and Insect and All LIFE, Microwave so-called Smart Meters. What really gets up my nose is the way many Victorian Electricity Customers don’t understand the Legal difference between a MANDATE and The LAW ! There is a huge difference, a ‘ Mandate ’…… Mandate from the Collins English Gem Dictionary Latest Reprint 1970….. man ‘date a.command of, or commission to act for another, commission from United Nations to govern backward people; instruction from electorate to representative — man ‘datary , –tory n. holder of mandate, —mandatory a. —mandated a. committed to a mandate. Therefore to add INSULT to injury we the Victorian Public are by definition ……” “ A Backward People,” Blow that for a LARK ! What an INSULT ! A Law from the Collins English Gem Dictionary……. ‘ Law n. rule binding on community, system of theses rules: Legal science: knowledge, administration of it, general principle deduced from facts; invariable etc.’ My understanding through my two lawyers here in Ararat is this….. In our Case according to Australian law which is based on British Law…………For any proposed law to become LEGAL, the proposed law must have been firstly drafted and then discussed by both houses of the Victorian or any other Australian State/s Parliament and agreed upon by both the Upper House and the Lower Houses of that State Parliament. If it cannot be agreed to by both of these parties, it has to be amended not once but a number of times until it is agreed to by both parties. Then it must go before the Governor General of Victoria in our case, then he examines this new proposed LAW. After he has examined it thoroughly but only if he does not agree with it for any reason he throws it out and it can never become law. If he does agree with it, he then signs it “INTO LAW” with his official signature of Office of the Governor General of Victoria, Australia and puts his official Stamp Of Office on it. Then he sends a copy of same back to the Victorian Parliament, and he should keep this original and New Law in his Statute Book/s of Laws. Dear Readers please see for your edification just how wicked these people are who are trying to force these ACCURSED Microwave so-called Smart Meters upon you all in Victoria by clicking on the Link below. The truly dopey term Smart Meters is to lull you into a sense of false security. What the past Labor Victorian Government did under the then Premier of Victoria, Mr John Brumby and Mr Peter Batchelor, the then Victorian Minister for power, some years back, was to get together with the then Governor of Victoria and the five Chief Executive Officers, C.E.O. of PowerCor and City Power who were then as they still are now privately owned by China, and Jemena and SP AusNet and United Energy Distribution were, and still are owned by Singapore. After these eight (8) people had got together over a number of days and or nights at these Clandestine Meetings they cooked up the Term of ‘An Order In Council ’ between them. This had never even discussed in the Victorian Parliament with the Opposition Party as Mr John Brumby the then Premier of the Victorian Labour Party well before 2009 knew that such a Sly Scheme would never be passed by the opposition Liberal Party. Therefore the “ Order In Council,” is as far as I and many others are concerned is just an …. “ Alice in Wonderland and Through the Looking Glass, Fictitious Law, and isn’t worth the paper it is written on as it was never as far as I can find out, signed into LAW by the past and at the time, then acting Governor General of Victoria when Mr John Brumby had been the Victorian Premier. It seems to me that both Mr John Brumby and the then Victorian Minister for Power as well as the Chief Executive Officers of the above named foreign owned Electrical Power Stations here in Victoria, seemingly hadn’t the slightest concern for the increasing number of Victorian People forced to accept these now proving to be Microwave so-called smart meters which soon after installation began damaging growing numbers of their Electricity Customers’ health and well-being from the Microwave Radiation which the World Health Organisation believes is now responsible for these Type 2B Carcinogens now coming to the fore here in Victoria and world-wide. Owing to the ever increasing number of Health Concerns regarding Type 2B Carcinogen Illnesses here in Victoria as well as in other countries the World, the World Health Organisation,W.H.O, states that they could soon have to lift this fast growing concern from the now ever increasing number of cases of Microwave Illnesses here in Victoria and world wide, to the next highest category of Type 2A Classification. Sadly this Duty Of Care for our Health and Medical Welfare has never been shown by the past Labor Victorian Government under John Brumby or under this incumbent Victorian Liberal Party’s then Premier Mr Ted Baillieu or its Minister for Power Mr Michael O’Brien in Victoria nor under this replacement Premier Dr Dennis Napthine or his new Victorian Minister for Power Mr Nicholas Kotsiras. Because of these past and still present CRIMES AND STILL ONGOING SINS OF OMISSION caused to still ongoing numbers of Victorian Citizens who are now Victims of Microwave Poisoning by those I have now named and shamed, every one of them as well as the Chief Executive Officer in charge of the Microwave Meters at the Department Of Primary Industry and his minions, must be Tried in Court. I care not a Jot or a Tittle if they need to be DRAGGED KICKING AND SCREAMING INTO COURT, BUT DRAGGED INTO COURT THEY NEEDS MUST BE AS SOON AS POSSIBLE FOR THE WEIGHT OF SIN UPON THEIR COLLECTIVE HEADS IS ENORMOUS AND MUST BE PAID FOR ! I hope that everyone has been utilizing their facebook pages, word of mouth, etc, to spread the word on these candidate’s. This Saturdays election provides us smart-deniers with a great opportunity to hand out anti-smart meter flyers at our local polling booth. Yesterday,I received a letter from Powercor,saying they had been locked out at first attempt to install. (I had locked my gate). “To date,we do not have an indication that arrangements have been made to allow us to install the smart meter in accordance with the Victorian Governments smart meter program. The access issue is described below: REFUSAL SIGN NEEDS TO BE REMOVED . The Katter’s Australian Party smart meter policy is an impressive read. It’s really great to see KAP and DLP standing up for Australians! I love the KAP’s policiy, I reckon it should become this country’s policy about smart meters, it really makes sense. For anyone thinking of voting for one of the major parties, remember, they are both bad, but at least Julia Gillard averted disaster, by making smart meters not mandatory at the last minute before COAG meeting and said “no one will be forced to have one”. Liberals are just too friendly with their buddies the power companies to care about what happens to people. Eric’s comment that the smart meters should only be optional if they are safe is the bottom line. Many people who don’t have a smart meter are being made sick by neighbors’ smart meters. This is a microwave “mesh” network which travels many kilometers. It is not safe and must be removed. upon us. Remember though, Katters preference goes to Abbott. One can always vote Katter and decide for oneself how to preference – no need to follow their how-to-vote cards. Remember, on your senate ballot paper, you don’t have to put a single figure “1” above the line if you don’t entirely agree with preference distributions of that Party. You can nominate your own preferences by numbering all the boxes below the line from “1” to “97”. So if there is any particular party that you don’t want up the order, you can just whisk them down the order by doing your own numbering. That is not a bad thing, remember Labor first put these things in. Preferences go to whoever the voter chooses – do that many people actually follow the how to vote card, I wonder? Except for the senate, where Katter have both Liberal and Labor in a lowly position. My Katter candidate told me he/they consider Liberal/Labour to be both on a par, “the two corporate-controlled major parties”, and something he absolutely hated was that sometimes you simply have to scratch backs. I take the use of the word ‘optional’ as just in reference to elsewhere. From reading their policy I feel their position is a whole lot stronger than that but, for sure, it needs to be stressed that these things should be banned outright. I received a e-mail answer from Emanuele Cicchiello (liberal) in response to my Question on his stand on Smartmeter. he basically said that he had no idea and that smartmeters were a federal and not a state issue. All my other question just received a lot of talk but not one answer at all. Thanks Glenn for your enquiry. In general the Greens support the roll-out of smart technology to enable rooftop solar power generation and demand-management. However I’ve not seen evidence that says everyone must have a smart meter, for them to be effective. Nor have I seen any high-level evidence (eg cohort studies, randomised trials) implicating smart meters as harmful. Accordingly I would conduct further research on these two points if a) I was elected and b) it came to a federal vote. I gather it’s more a state than federal issue, but to be clear, on the basis of my limited knowledge of the subject, I would not be supporting a campaign to ban them. You certainly need to do a lot of research and then you will see just how dangerous these dopey and now proving to be ACCURSED Electric Microwave and far from Smart Meters really are. They by the British Parliamentary ORDER have STOPPED the roll-out of these stupid and deadly machines in the whole of the United Kingdom now, for a multitude of very good reasons. I have been doing Smart Meter research now, for nigh on three years and still continue to do World wide research on this now proving to be Type 2B Carcinogen and Evil Technology. In Holland and in the United Kingdom right now, people are getting the Electric Power Companies to remove these dopey and far from smart and in mounting numbers of cases INCENDIARY Microwave and Far from Smart Meters and reinstall the safe and passive Analog Electric Meters once stolen from them with all the expense being paid for by these Electric Power Companies in both Holland and the United Kingdom. The very same needs to be done here for our privately owned home and small business owners in Victoria Australia. Thank you for your email about the smart meter rollout. When this was happening several years I took this matter up with the State Government on behalf of constituents who were opposed to smart meters and wanted to be able to opt out of them. I have not been contacted by any constituents for quite some time now about this, and I had assumed that the rollout had been completed. If this is not so, please let me know where rollout activity is still happening, and I take this matter up on your behalf. Glenn, as you can see on this website there are many many distraught Victorians. You may need to refer him to the website or perhaps just educate him. Tell him about “best endeavors to install by Dec 2013” and the ferocity of Power Companies and their “roguish endeavers” to try and roll over so many many customers making a stand. Assessing the policies of the major parties vis-a-vis smart meters is difficult for the person in the street mainly because we do not know the thinking of those wishing to represent us. We have no say in the selection of the candidate, in the policies they will take to Canberra, and how they will vote on any particular issue. What we do get is political spin tailored to the audience at hand. In some ways, the political scene resembles one of those masked balls popular in renaissance Venice. It does not help that the policies of the major parties are infested with opinion posing as fact, pork-barrelling and a short term focus. In general we might say that the libs support commercial interests with a few crumbs thrown to the middle class; labor supports the middle class with crumbs thrown to the workers; and the greens supporting the environment while showing an insouciant disregard for human health, (Think roof insulation, wind turbines and smart meters). Frieda, don’t agree to anything with them. Tell them the deal’s off and LOCK YOUR METER BOX SECURELY and put up a non consent notice. Any dialogue with them will only result in them trying to take away from you your RIGHT to refuse. How do they take that right away from you ? They’ll tell you that you don’t have that right. LIES. If you believe it you’ve fallen onto their trap. They are not your friends. They are working against you. Stand up and exercise your rights and say NO and lock them out and don’t bow to their threats. The time is fast coming where they are going to be made accountable for their threatening actions. Don’t allow yourself to be talked into a situation that you can’t easily reverse and where you’ll have no peace once they’ve thrust that situation upon you. It’s this simple just padlock your Electricity Meter Box as I and hundreds of thousand of us have done and keep it padlocked. Put a Perspex window in it so the meter reader man can get his readings for billing purposes, simple as that. Then send another letter to the foreign owned Electric Power Company stating clearly that you refuse to allow a dopey deadly Type 2B Carcinogen and far from Smart Meter on your property. Send all your letters by Registered Post and keep copies of same for Legal Purposes. Also send the Anti-Harassment form below properly filled out by Registered Post and get a signed receipt back from the person at the Power Company to prove to you that they have picked up your Letter/s and this Notice below. Smart meters should only be optional if they are safe. Smart meters that are not safe must be BANNED OUTRIGHT. That which is not safe should not be an option for anyone. Let’s think about it a little bit more carefully when we say that smart meters should be “made optional”. Yes, there is too much lee-way in the word ‘optional’ Power -mongers (politicians) will get around this word and twist our arms till we give in. Smart meters are not safe, they should be stopped, and replaced with analogue meters. A device that is dangerous should be banned,- not made optional. Thanks to those who put in the hard work to come up with this political information to help me in deciding how to cast my vote. Lets hope whoever gets elected does something about these new pollutions and gets them removed as they are not good for anyone except the money hungry power companies and they aren’t even Australian. Both Katter’s Australian Party and DLP (Democratic Labour Party) have strong anti- smart meter policies. So let’s give them our support at the election. Read you rights under Common Law which protects all of our rights as private individuals. We must first grant consent to have those rights removed before they can be destroyed and if we reclaim them that reclaim action stands. Common Law as to supreme rights to private living Common Law serves as the foundation stone of Statute public law. The claim of rights …..This is not about OUR BURDEN OF PROOF the Claim of rights reverses that burden of proof and places it squarely on the UTILITIES to PROVE that the have the right to experiment to trespass to violate or intrude violation of your rights etc .It becomes up to THEM NOT US to PROVE that this is SAFE and LAWFUL. The UTILITY is put on notice by customers to PROVE it is not in VIOLATION of OUR RIGHTS .”UNDER COMMON LAW” defend your personal rights.Note Use Common Law only……never mix with Statute Law or Public Law. Defending your home and property is your Constitutionally protected right. Protecting your rights so often best done under Common Law. Concern…..Carcinogen -spewing spymeter off the wall of your residence which is not licensed either as a – radio broadcasting station or a 24/7 business hub to collect your neighbours tariffs for your local Power company.